I don't regret buying Gunpoint, but I do regret paying full price. If you can get a heavy discount, it's not bad. The biting humor and next-level music aren't enough to salvage the underdeveloped gameplay. It doesn’t sit well with me to write this Gunpoint review with only three hours played, but what can I do? The game only offers three hours of content. I could go back and replay the missions, but there’s really nothing more to experience—and that shows how much this promising game disappoints. 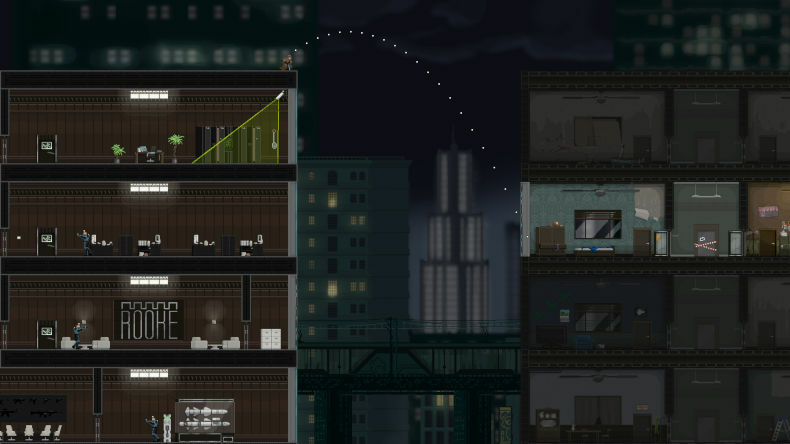 Gunpoint is a side-scrolling action platformer where you play as Richard Conway, a private detective/spy-for-hire who starts off investigating an unusual homicide and gets caught up in a larger conspiracy between two shady businesses. 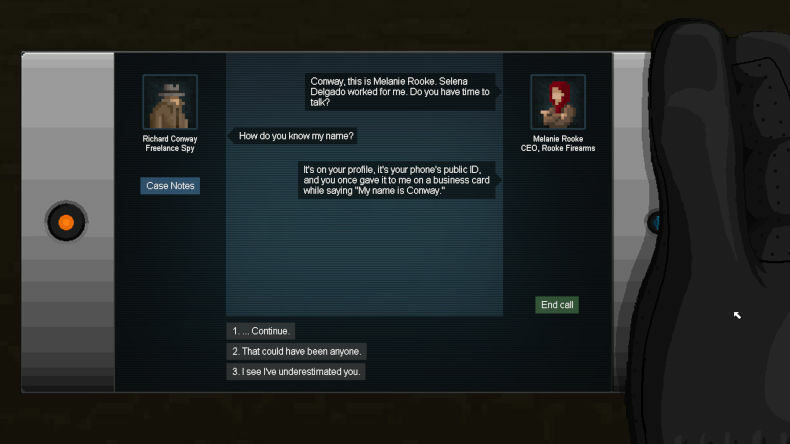 A series of missions takes you through the narrative, with each mission being stealth puzzles that involve hacking guarded terminals or retrieving valuable information. The game has several core mechanics: the ability to climb walls and across ceilings, the Bullfrog pants that let you jump to crazy heights, and the Crosslink which lets you rewire building electronics. That last ability is the most important one, and is the primary key to solving nearly every late-game mission. 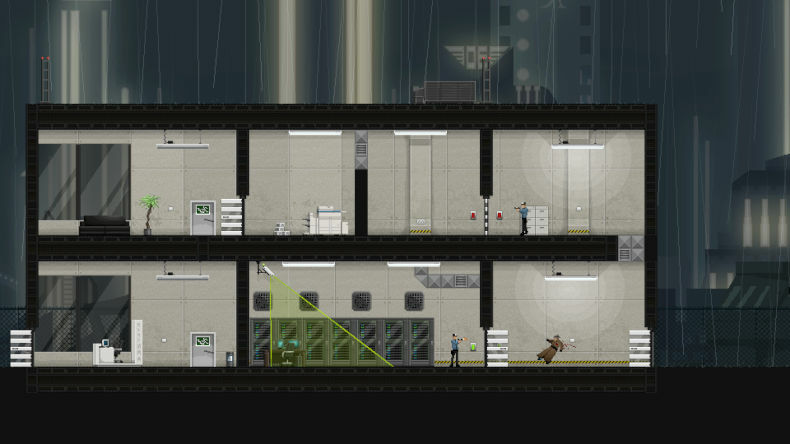 Gunpoint missions always involve at least one building, and the building is made up of various entities: doors, lights and switches, security cameras, elevators, trap doors, and more. Using the Crosslink, you can wire any entity to another entity such that when the first entity gets triggered, it then triggers its connected entity. This lets you, for example, rewire a security camera so that it opens a door instead of setting off an alarm when you enter its field of vision. While figuring out how to access different areas of the building by rewiring circuits is the core of Gunpoint‘s gameplay, things get more interesting when guards are introduced. Guards can shoot you if you enter their line of sight, and their shots are insta-kill. You can work around them by climbing on walls, hiding in elevators, turning off the lights, or pouncing and knocking them unconscious—at least until the later missions, which have more advanced guard types who are immune to being knocked out and can even see in the dark. If there’s one thing I absolutely love about Gunpoint, it’s the music. The menu screens and mission briefings are set to what I can only describe as “elevator jazz” (my knowledge of music genres is sorely lacking), but the actual missions are played to funkier tracks with more bass and rhythm. It fits the noir atmosphere perfectly and sets the mood right from the get-go, and is downright lovely to listen to. I actually use the OST as a backdrop while I’m working. Mechanically speaking, Gunpoint is fun. It doesn’t take itself too seriously and deftly avoids the trap of thinking that stealth puzzles have to be slow, methodical, and punishing. The missions play out in real-time but there’s no time pressure or sense of urgency, which I greatly appreciate because a lot of stealth games force you to perform actions exactly when the game wants you to act, and that can lead to unfun stress. Gunpoint is content to let you play at your own pace. When you fail, the mission immediately restarts—and since the missions are short, usually just a few minutes long, it never quite reaches rage-quit levels. This is an action-heavy title with tight controls that feels good to play, which can’t always be said about side-scrolling platformers or stealth-based puzzlers. I never felt as if I was wrestling against the controls. I also like that the missions require a mixture of puzzle-solving logic and real-time execution of actions, and the game strikes the best balance between the two. I’d be remiss if I didn’t touch on the dialogue in Gunpoint‘s mission briefings, which is half the reason why people gushed over the game when it first came out. I have to hand it to developer Tom Francis: he did a great job capturing the cynical heart of the noir genre. When speaking to clients, you can choose between multiple responses ranging from straight-laced to uber-sarcastic, and the latter lines are almost always hilarious. It never gets old, although maybe it would have if the game wasn’t so short; the snarky dialogue never had a chance to outstay its welcome. That’s actually the worst thing about Gunpoint: by the time you’re settled in and comfortable with how the game works, it’s over. As the narrative unfolds, you’re introduced to characters and led down a path towards a conspiracy story, and just when it feels like the main plot is about to take off, it ends. Gunpoint feels like the prologue to a more interesting tale, and to say that it felt anticlimactic would be a huge understatement. Gunpoint also deceives you into thinking that your dialogue choices can affect the outcome of the game—and while there are technically two different endings, the missions are the same either way. If there’s a reason why a faux-branching narrative was implemented, it eludes me. The developer certainly could have pushed it much further with multiple paths that actually lead to different missions and endings, but as it is, it’s nothing more than an incomplete feature as far as I’m concerned. Speaking of incomplete features, the system for buying new abilities in the shop and upgrading those abilities is… poorly thought out, to say the least. You’re given an abundance of money and upgrade points just by completing missions, so you never have to make any decisions on what to buy next or what to upgrade next. The choices are made for you. So why have a shop or upgrades at all? These design choices feel like unrefined afterthoughts. To be honest, the whole of Gunpoint could be summed up in that way: one big unrefined afterthought. It feels like the developer spent so much time wondering if he could implement certain features that he never stopped to think if he should. Many game mechanics are never pushed to their limits and explored fully, which is what a puzzle game should aim to do—instead, we get three hours of half-baked level designs that introduce new elements just for the hell of it. The saddest thing about this game is that it had so much promise as a creative puzzle game that encouraged outside-of-the-box thinking for solving missions. But most missions have to be completed in a certain way in a certain order, especially once you get to the latter missions that have multiple Crosslink circuits. By requiring the player to “unlock” access to certain Crosslink circuits by touching circuit boxes in rooms, it forces players into linear problem solving: to reach Box Z, you need Circuit Y, so you need to reach Box Y, but to get to Box Y you need Circuit X, so you have to first reach Box X… and so on. This kills creative thinkspace. To be fair, the game comes with a built-in level editor that you can use to create your own missions. 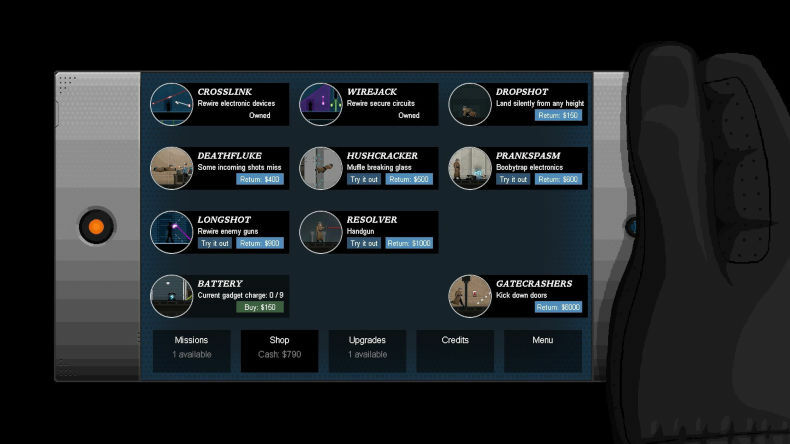 You can even download user-made missions from the Steam Workshop, and you can share your own missions for others to play. I fiddled around with the level editor for a bit and found it relatively easy to pick up, but didn’t find it enjoyable enough to sink more time into. The inclusion of a level editor is welcome, but doesn’t justify the tiny amount of core content. Gunpoint is not a bad game. Again, the music is phenomenal, the controls are tight, the dialogue is generally well-written, and the balance between stealth and action is solid. But the sparse content and lack of gameplay refinement makes it feel like a top-shelf Flash game than a desktop game to be sold for hard-earned cash.